A worn dull staircase can be transformed.with the renovation-kit for indoor stairs and complete with all the necessary details. The system is developed with simplicity, durability and design as the most important qualities to reach the final result – a neat, easy fixed and hard-wearing flight of stairs. It comes in three three types of wood, each 15 mm in thickness. • Oak , made of solid 15 mm fully stave glued oil primed oak. • Walnut , 2 mm oil primed walnut veneer with a core of plywood. • Oak , 2 mm lacquered maple veneer with a core of finger jointed maple. And also in three different laminate decors, 9 mm thick with a core of 8 mm MDF. or 1450 x 435 mm dimensions. Laminate treads are also available in 1300 x 368 mm or 1450 x 435 mm dimensions. The stair renovation requires a minimum of preparations before the assembly. It works on most surfaces and is suitable for both open and closed staircases. • Tread with an integrated nosing that gives the step a self-supporting function. • Trailing edge for open stairs. • Riser for closed stairs. • Tread with double nosing for bigger and deeper steps. These can be cut diagonally and thereby be used for two treads. • Widening-piece without nosing for extra deep steps. The sides of the widening-piece and the backside of the steps are traced for easy joint with joint biscuits. Place the joint biscuits approximately 200 mm apart. For assembly of the renovation parts is recommended MS-polymer glue. It is a type of glue that neither contains water nor solvent but cures with the humidity in the air. It works both as a glue and filler. It will not shrink from curing and is permanently elastic. It is padding and will not compress and is therefore much suitable for rough surfaces. Solvent free mounting glue. Retains some elasticity after curing. Very high adhesive strength. Moisture curing.It costs 12e /piece. A worn dull staircase can be transformed with the renovation-kit for indoor stairs and complete with all the necessary details. The system is developed with simplicity, durability and designs the most important qualities to reach the final result – a neat, easy fixed and hard-wearing flight of stairs. • Oak, made of solid 15 mm fully stave glued oil primed oak. • Walnut, 2 mm oil primed walnut veneer with a core of plywood. • Maple, 2 mm lacquered maple veneer with a core of finger jointed maple. 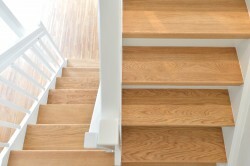 Have the appearance of an oak staircase at the fraction of the price of solid oak staircase. Is your staircase looking a little tired and in need of a face lift? Would you like a solid oak staircase, but have been put off by the price? If so the Duri Oak Stair Conversion System is what you’re looking for.This revolutionary system was developed in Sweden and is new to the Irish market. The oak stair conversion system from Duri uses solid oak treads and oak risers which have been pre-finished with a danish oil. The treads and risers have been supplied over sized and installation is a simple matter of cutting them to the size of your staircases existing treads and risers before fitting them using a polymer adhesive. With a little DIY skill and a few hours work you can transform your existing staircase or a softwood staircase to look like a solid oak one at a fraction of the cost.The Duri Oak Stair Conversion system will give your staircase a wonderfull, warm inviting look and will be the centre piece of your home. Stair renovation system gives new look to the stairs and is sold pre-oiled to remove any finishing requirements.A worn dull staircase can be transformed in to a decorative piece of furniture with solid oak treads and risers. Stair renovation-kit for indoor stairs complete with all the necessary details. Tread with an integrated nosing that gives the step a self-supporting function. Trailing edge for open stairs. Tread with double nosing for bigger and deeper steps. These can be cut diagonally and thereby be used for two treads. It comes in three three types of wood, each 15 mm in thickness. Oak, made of solid 15 mm fully stave glued oil primed oak. Walnut, 2 mm oil primed walnut veneer with a core of plywood. Maple, 2 mm lacquered maple veneer with a core of finger jointed maple. Quick-Step Laminate planks not only look great on your floor; you can also use them to finish your staircase.